From the Allure Bridal website: "This 2 piece gown features a charmeuse slip and lace Applique overlay adorned with embroidery and crystals. The fabric of the dress is: Charmeuse and Tulle. The color of the dress is: White/Silver with a white slip underneath." 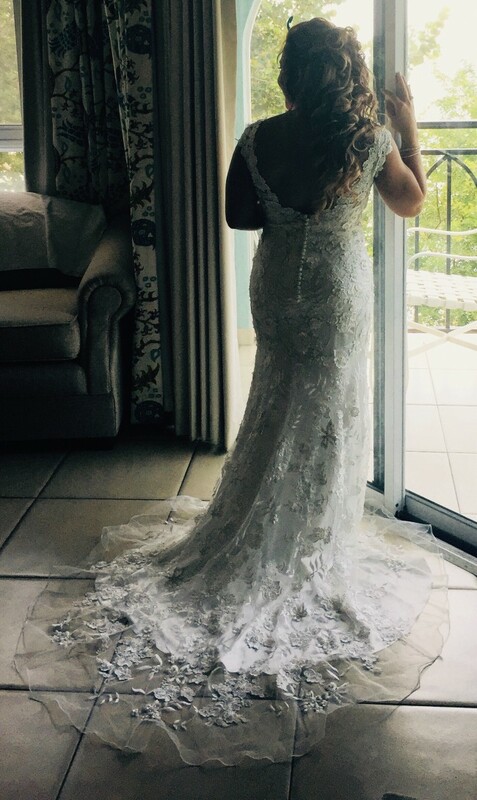 The dress was worn once for a wedding in 2015. It was immediately dry cleaned and packaged in a bridal keepsake box since then. It was just removed from the keepsake box for the intentions of this listing. Alterations were minimal. Length was taken from the bottom to fit a 5ft frame (while wearing 4in wedges). Also, A cup pads were added to the dress and the sleeves minimally shortened and taken in to snugly fit a small bust size.